” I‘ve signed us up for a charity walk,” announced my mother returning one evening from a W.I. meeting. This was many years ago – it turned out to be a 16 miler starting from Eastbourne with a steep climb to Beachy Head followed by all Seven Sisters before dropping down into Cuckmere Haven and swinging inland to complete the circuit. I remember fine weather, the downhill being worse than the up, blisters and stations with ladies handing out orange squash to keep us going. Actually my father had other refreshment in mind and took us through Friston Forest at the double in an attempt to get to the Eight Bells at Jevington before closing time. “Orange Squash”? proffered the lady. Since then I’ve dipped into the Sisters, stood around with the photographer waiting for the light to fall “just so” on their faces, and sailed past them several times. From the sea at night this is a notably dark stretch of coast, almost devoid of light. In the 1926 property developers nearly had their way, but £17,000 raised at short notice by Society of Sussex Downsmen with support from an eclectic group of individuals – Rudyard Kipling among them – saved the day and the view for our pleasure. Until recently though, I hadn’t walked their length again. With a stiff south-westerly blowing we take a sailors decision to go east about with the wind behind us. Our starting point is the visitors centre at Exceat on the A259. Skirting the ice cream van opening up at the entrance to the car park we set off on the flat, concrete path that runs along the eastern edge of Cuckmere Haven before branching off to climb out of the valley to Haven Brow, the first sister. With some height you can see the sinuous winding route the river took before it was channelled between banks and given a straight run to the sea. Cut off, the classic meanders are slowly silting up, bands of distinct colonizing vegetation clear from the hill. I wonder what the estuary will look like in years to come now rising sea levels and the escalating costs of maintaining coastal defences are prompting a re-think towards “letting go” and working with instead of against nature. On top of Haven Brow groups of German and Spanish students are gazing across the Channel towards out-of-view France, while close inshore a fishing boat rolls rythmically from side to side in milky, chalk filled waves. There are signs warning of the dangers of standing too close to the edge; undercut by the sea from below and cleaved apart by the action of water and ice from above the cliffs are retreating – you wouldn’t want to be standing on a chunk that went plummeting seaward. We leave the students taking photos and stride off over springy, short cropped turf – it’s good to walk on, kept in trim by the by the sheep and rabbits that are grazing nearby. Three bottoms and brows on we meet two ladies on Flagstaff Hill. They’ve walked from Crowlink inland to blow the cobwebs away. It does make you feel good stepping out over these easy rolling downs, up high, in the open with glorious views all around. Several undulations later we come to Birling Gap where the Jevington smugglers once landed their contraband. Standing on the sturdy platform of steps that leads from the cliff top down to the beach this seems an unlikely spot to be unloading ankers of gin and such like until you put back 200 years of erosion and imagine a cart track leading gently downhill to a shoreline now vanished. 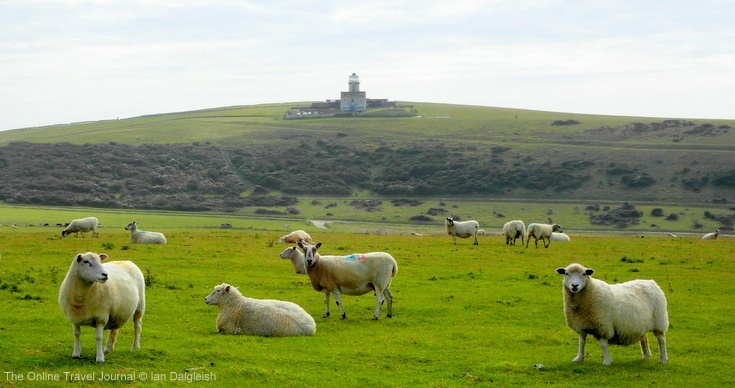 Following signs for the South Downs Way, squat Belle Tout Lighthouse soon comes into view, safely, for now, tucked back on the downward slope of the cliff. Dating from 1832 it wasn’t unsuccessful as a lighthouse, but became unviable when the light, designed to shine beyond the rocky ledges, began to fall in the danger zone as the cliff crumbled away. Instead after a period of mixed fortune Belle Tout has found fame on TV, featuring in the BBC production of Fay Weldon’s, “Life and Loves of a She-Devil”, and more recently in the leading role being moved, in entirety, 17 meters back from the brink. The lighthouse is now a privately owned hotel with some of the best views in the country. The final stretch is a steady climb up to Beachy Head, the steep slanting backs of the cliffs obscuring our view to the sea until we get higher. With a photographer’s eye Ian comments on the triangular form of the cliffs, green over white, when seen from the side it’s nicely illustrated in the Beachy Head pub sign. One peep over the edge at Beachy head lighthouse 162 meters below is enough for me. I feel on safer ground perusing the plaques around the walled seat a bit further on; one remembers Downs Ranger P.C. Harry Ward who rode these cliffs, until his retirement in 1966, on the lookout for souls in danger and distress. 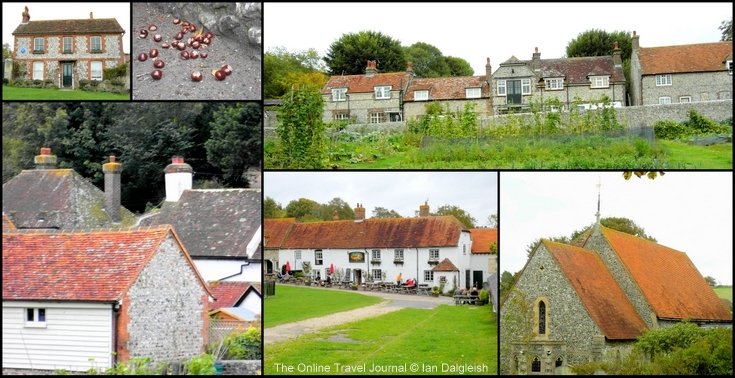 ﻿Our return route takes us along a ridge a little inland from the coast to the village of East Dean and then back through Friston Forest to Exceat. Away from the coast the short turfed downs quickly give way to farmland. Sheep and flint stone walls are an integral part of this landscape. Squarish, teddy-faced Southdowns are the native breed. I wouldn’t like to say where they’re from, but there are interlopers grazing in the fields around the Seven Sister’s Sheep Centre, black faced sheep, horned sheep, some with fringes and some with top-knots. Snuggling in the valley the old part of East Dean is as a village should be with a pub on the green, a bench in the shade of a tree to rest a while, a church dating back centuries, flint walled houses, even a post office still. More – there’s a teashop, delicatessen and Thai restaurant. Times and licensing laws have changed, we walk into East Dean around three in the afternoon – the door of the Tiger Inn is open. Bus routes 12/12A/12X and 13X run between Brighton and Eastbourne stopping at Exceat and East Dean.